We’re laying all of our cards on the table with this one; Slots 4 Kings mobile slots is pretty ace. It’s an mFortune Exclusive fit for a King…but you don’t have to be royalty to take these reels for a spin. Will you reign supreme and win yourself a princely sum? Featuring 20 win lines, a multiplier mini-game that’s more a battle for the heart than the throne, and a huge progressive Jackpot up for grabs, you’ll soon see that there’s no joker in the pack when it comes to this mobile slots game. Slots 4 Kings is compatible with devices running iOS 10 or Android 5 and above. You can also play online via a desktop or laptop computer. It’s time to show us your hand, and get started with Slots 4 Kings. Tap “Play for Real” from the game lobby to launch the real-money slots game. First up, you’re going to want to choose a number of win lines to play across and a bet-per-line. Tap ‘Bet/Lines’ in the bottom right to bring up the menu, and use the ‘+’ and ‘-’ buttons to adjust these values. As you do, the amount displayed next to ‘Total Bet’ will increase or decrease accordingly. Your total bet is your bet-per-line multiplied by the number of win lines you’re playing across and is how much you’ll spend per spin. For instance, say you bet 10p a line and choose to play across all 20 win lines: your total bet will be £2. You can bet anything from 2p a line up to £10 a line. When you’re happy, tap the white rotating arrow and the playing-card-themed symbols will burst into life. The reels will then spin before coming to a stop at random. Need both hands to keep those cards close to your chest? Tap ‘Bet/Lines’ and then ‘Auto Spin’. From here, you can set a number of spins you’d like to play automatically along with a credit limit and maximum win amount. When you’re happy, tap the green arrow. Slots 4 Kings will play through that set number of auto spins coming to a stop when the mini-game is launched, you reach your credit limit, spin in a win that meets that maximum win amount or when you run out of spins. You can also revert to manual play at any time by pressing ‘Stop’. All hands on deck! Now you’ve got a grasp of how to play Slots 4 Kings by mFortune Casino, it’s time to put it into action and get spinning. Set your bet parameters, decide whether you’re going for manual or Auto Spins, and tap the floating arrow to start the reels. The playing-card themed symbols – which feature the four Kings of hearts, diamonds, clubs, and spades, as well as numbered cards – will then spin and stop at random. There’s no joker in this pack, and you’ll always know where you stand when it comes to win lines as they always pay from left to right. If you ace it and spin in a winning combination of symbols, your prize will be highlighted on screen before being added to your total credit. Just what those winning combinations are, depends on the symbols. For some, you’ll need to line up 2 or more, whereas you’ll need 3 or more of others. Tap the three horizontal lines in the top left to open the game menu and select ‘Paytable’ for full details. You could be in for a King’s ransom playing Slots 4 Kings and unlike most card games, there are no complicated rules to follow here. If you spin in a winning combination of cards, you’ll receive a multiplier of your original bet-per-line. mFortune’s royal family are pretty generous. If you spin in winning combinations on multiple win lines with a spin, they’ll be added together before being automatically added to your total. We don’t want to be a right royal pain, but only the highest win-per-line will be paid. Your wins could be soaring to dizzying heights if you spin in a card bearing a blue eagle. This card is a pretty ace one to spin in, as it’s your Wild symbol and could help you turn a losing spin into a winning one. Wild symbols can substitute for almost any other Slots 4 Kings symbol, apart from the Free Spins symbol. If you line up two As with an eagle Wild on any of your active win lines, the Wild serves as an A and you’ll receive the multiplier for 3 x A symbols. 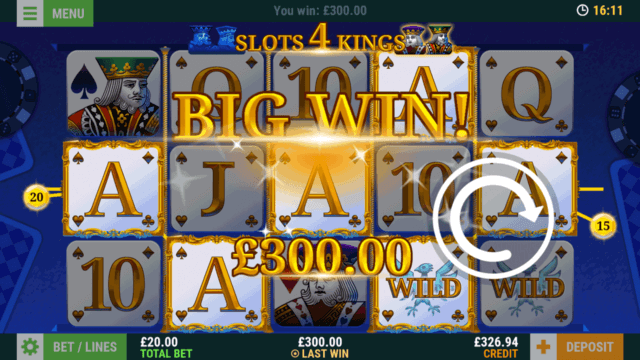 We need to call a spade a spade – or a Wild a Wild – and remind you that the Slots 4 Kings Jackpot can’t be won where a Wild lines up alongside your Jackpot symbols. To win that King’s ransom, you need to line up five crown symbols. Luck really is a lady in the Slots 4 Kings mini-game, Find the Lady. Spin in a King symbol of each suit – hearts, diamonds, spades, and clubs – to enter the mini-game where you could bag yourself a win fit for a King. In Find the Lady, you’ll see five playing cards all face down on the table. Four are Kings, one is the Queen. Can you find the Queen and win a mega multiplier? Before you pick a card though, you’ll be able to choose the prize on offer or choose to play on and gamble your bet. If you choose to gamble, you then need to pick one of the five cards. Find the Lady, and you’ll exit to the main game with a huge prize. Beware though, because if you find a King you’ll return to the main reels empty handed. What will you do? While the solid gold crown symbol gets you one step closer to the Slots 4 Kings progressive Jackpot, you should still pay attention to the leaf crown symbol. That’s your Free Spins symbol, and you’ll grab some spins – courtesy of the King – if you spin in 3, 4, or 5 of them anywhere on the reels. 3, 4, or 5 free spins symbols will award you 5, 10, or 15 free spins respectively and, as the treasury is footing the bill here, your credit won’t take a hit. Your free spins will however, lock at the number of win lines and cost-per-spin of your last paid-for spin. Join an exclusive club today, and show us your hand in Slots 4 Kings mobile slots. There could be a princely sum waiting for you. New to mFortune Casino? Register for your first and only account today and grab a free, no deposit welcome bonus of £5* and a 100% deposit match – up to £100 – on your first deposit*. Sign up today, and see what you can win with Slots 4 Kings. *18+. New players only. All bonuses awarded as bonus credit. 100% deposit match of first deposit, up to £100 and paid as bonus credit with a 1x wagering requirement. Bonus credit cannot be withdrawn. Max withdrawal without depositing is £200. T&Cs apply. Slots 4 Kings has a theoretical return to player of 94.6%. This is based on long term playback. System malfunctions void all payments. Monies are staked in the following order: winnings, player deposits, bonus credit. mFortune general terms and conditions apply.